Most vehicle manufacturers are involved in an expensive, long-term and complicated race - to be the first to bring a fully fledged self-driving car to market. This fight already includes big names like Tesla, Nissan, BMW, Ford and Mercedes-Benz, all making incredible strides towards a product that could actually be brought to market. Now Audi is stepping into the ring and has a tag team buddy, Nvidia - a company renowned for computer graphics - to help create a self driving car with its own brain. Audi and Nvidia are no strangers to each other, it wasn't so long ago that one of the biggest names in the PC market helped the luxury car arm of Volkswagen design a fully digital virtual cockpit. This renewed partnership between the two companies was revealed by Nvidia CEO Jen-Hsun Huang at CES 2017 — he detailed the companies are aiming to produce a ‘level 4’ automated vehicle, this means a car that can perform all of its functions without a driver (most are currently 'level 2'). CES gave both companies the chance to showcase what they’ve been working on — introduce the self-driving Q7 SUV, which according to Nvidia, using their AI technology, learned to drive itself in just four days. AI is the real differentiating word here — although the Q7 was outfitted in typical prototype graphics, it’s Nvidia’s Drive PX 2 driving brain that is the real star of the show. The Q7 Deep Learning concept needs to learn how to drive itself, there’s no pre-programmed system here present in other manufacturers’ self-driving car attempts. Instead the vehicle needs to be driven by a human user in order to learn its terrain and other parts of its environment. 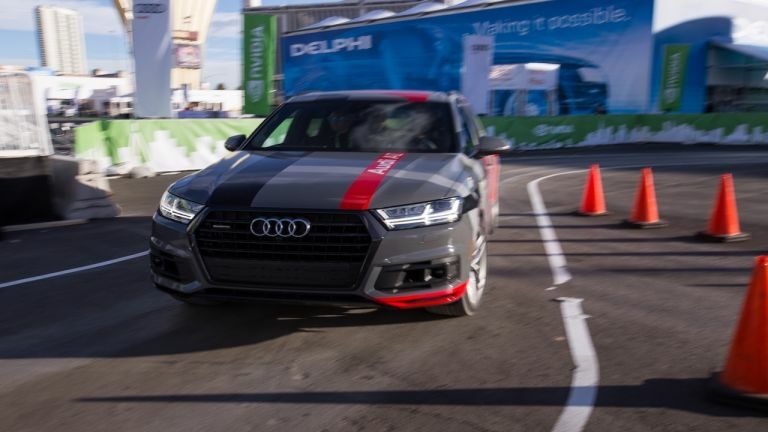 The testing was done in a car park outside the Las Vegas Convention Center, and although many would argue this was more of a controlled drive, because of the repetitive and limited nature of a test track, both Audi and Nvidia employees put obstacles in the way on different laps to which the car manoeuvred around appropriately. Both companies admitted the Q7 is still an early showcase into the future of autonomous cars, they are aiming to bring their first self-driving car to market in 2020.